Every time you complete a scripture chart, the primary president gives you a little prize. I was surprised to see Paige turn in a completed chart, since she hadn't done any reading that week. 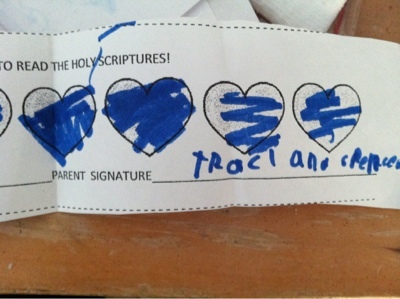 But my signature was on the sheet (and Traci's, too), so I guess she must have done all her reading after all. I can't wait to see what else I magically sign in the future. @Erin, I just looked at your remodeling photos on FB last night. Holy moly! What an undertaking.